This past weekend we noticed that what little muscari we still have scattered about the lawns and tucked along the hedges at Darlington House was in its final stages of blooming. A decade or more ago, before a series of landscape improvements, grading projects, and removal of decrepit and long-neglected garden beds, we had bumper crops of muscari on our property that had wondrously naturalized just about everywhere. Today the hanger-on bulbs continue to sprout only here and there, and are a treasured reminder of our former bounty. Our collection of vases and vessels for arranging flowers and branches has over the years become extensive and varied enough that we always seem to have the right container or group of containers for every need. Yet with so few muscari, it was clear we needed a new option. Long gone are the days when Boy could quickly gather dozens and dozens of stems to pack several English porcelain coffee cans. Saturday, while exploring the current offerings at Red Chair Antiques, a wonderful shop in Hudson, New York, Boy spotted a shelf displaying, among other bits of stoneware, seven little antique stoneware ink bottles, each measuring about 2 ½ to 3 ½ inches tall and each with a narrow neck and opening. Choosing among them was not an option; all seven were immediately wrapped by the charming clerk and accompanied us back to Darlington. While the diminutive pots make an instant sculptural collection within Boy's stash of larger stoneware bottles, pots, and crocks, they are the ideal size and design to cradle several stems—or just one stem—of muscari, one pot alone, or in groupings. They are perfect, too, for displaying the flowers of other little spring bulbs, such as galanthus (already finished in our lawns) or scilla (of which we have probably thousands continuously naturalizing through the grass). I am hopeful that when we arrive at the house this coming weekend we will discover other diminutive spring-blooming flowers to fill our new old little vessels. I think that "choosing among them was not an option" will be my new favorite phrase when going collecting. My favorite post so far! I think that every time! 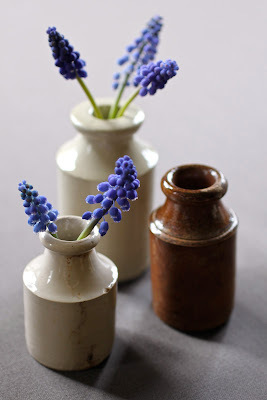 The collection of old inkwells does, indeed, when grouped together, make a sculptural display and will, most certainly, look charming when filled with Muscari, grape hyacinths. What a nice reminder of Granny Darling who also had an extensive collection of tiny vases for just such circumstances. Reggie, these inkwells are wonderful and now a new collection is off to a great start! Lovely little flower vessels. Just perfect! Such a diminutive item should be collected, not owned singly. What a wonderful instant collection of charming little ink pots. I adore diminutive flower arrangements, such as the one you illustrate in your beautiful photograph. I use antique laboratory or apothecary beakers for such arrangements, or small Victorian jelly and syllabub glasses. When I was a child, I entered a competition at school to create a flower arrangement in an egg cup. Large arrangements may make a grand statement when appropriate, but it is the little jewel-like arrangements that really do capture my imagination and beguile. Old stoneware ink pots have long been among the floral containers of choice here at the Dilettarium, as they were for my parents and grandparents before. May I also recommend, if you haven't discovered them already, the classic cream glazed stoneware snuff jars? Old fashioned flowers simply arrange themselves in these beautiful containers. Pick, cut stems to length, insert, add water, wait for guests to swoon. What a delightful spring unfolding at Darlington. Those diminutive bulbs are so rewarding and perfect in those ink pots; great find. Boy, the photos are fabulous! These are perfect! I have recently become obsessed with violets and containers like this would be perfect for the little bouquets. 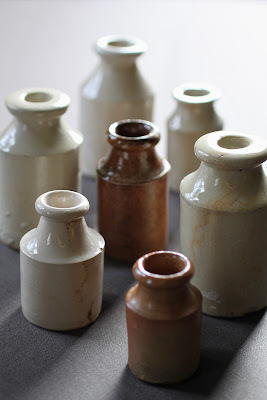 I will have to go hunting for my own small vessels, perhaps not stoneware ink bottles, but something similar. So precious! 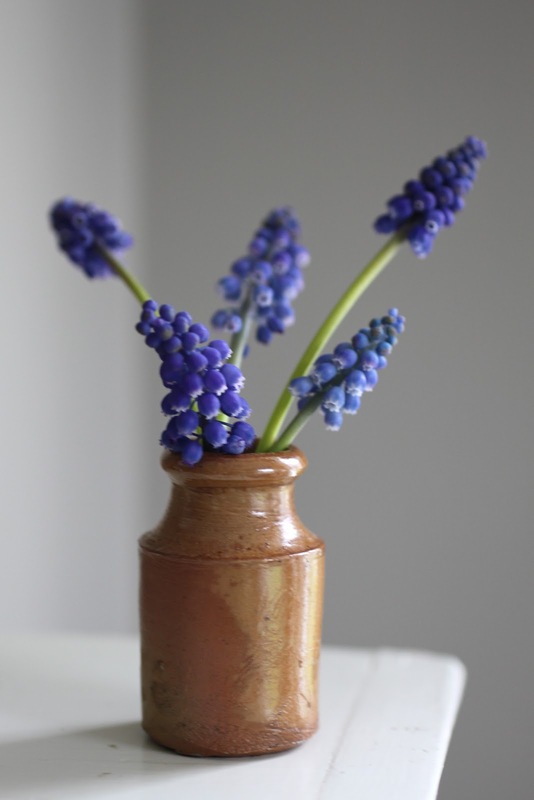 I just love muscari, they're one of my favorites . Those little crocks would be sweet filled with fresh herbs too, wouldn't they? 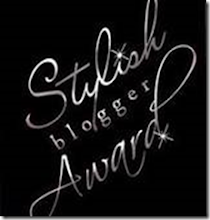 Please do comment! I welcome and encourage them, and enjoy the dialogue. Saint Grottlesex/Ivy League somewhat-observant Episcopalian WASP living on Manhattan's UES during the week with a career in finance. Weekends I hightail it up to the Hudson River Valley where I'm ruinously restoring and furnishing a jewel of a Federal house with my spouse, Boy Fenwick, and our most-adored pug, Basil, who has decided views on these subjects. The Family Secret . . .
My friend Ellie in Paris is having a sale in Los Angeles!